United States, Interesting Collector Collection, Few thousand from 1847 to 1981 in 2 Scott National albums, majority used with a few better o.g. items, including used #1-2, 112-212, Columbians to $1, 292, C14-C15, mint 505, and 630 plus Back-of-the-Book issues, few faults in 19th Century, otherwise mostly Fine or better. United States, 1908 to 1920 Washington-Franklin Mint and Used Stock, Identified and mounted on Vario pages, duplication as to be expected, all priced and ready for retail, inspection recommended, generally Fine to Very Fine. United States, Dealer Inventory Accumulation, A longtime dealer is slimming down his inventory and has put together a huge lot filling three cartons of collections, stock books, file folders and boxes of desirable material, including album of used blocks of four starting with #614-16, 621, Farleys, complete Famous Americans and Prexies, 1053, Airmails, etc., album of early Revenues plus reds and greens, mint/used Ducks, etc., binder of mint/used Canal Zone, Hawaii, Cuba, etc., Scott National incl. 294-99 mint/used and later, Scott National with few mint/used early 294//99, 300-09, 323//27, some Farleys, used Q1-10, few Ducks; album with few classics, large and small Bank Notes, 323//27 used, 548-50, mint 614-19, most Farley S/S then solid mint to 10¢ Commems; binder of BOB with mint/used Dues, Special Delivery used E1-14 (no E12), used Q1-12 plus mint blocks of 4 of the 1c, 2c, 4c, 5c, many officials, O1//124, small album with mint 294-99, 328-30, 397-400, 548-50, most Commems to 1940, C1-22 (no C13-15), stockbook of mint, mostly 1-5 copies, 615-21, good run of 2¢ reds, Parks, etc. ; elongated shoebox with mostly all plates, blocks and singles, 617 onward to 5¢ commemoratives; folder of early mint blocks and pairs such as 294, 328, 370, 337, 614-15, 619, C18 etc., folder of mostly 19th Century with multiple shades of 10, 11, 26, 65 and onward, folder of Parcel Post, Revenues and Ducks, large glassine filled with mostly n.h. plates, 1930-42; stockbook with many classics to the Kansas-Nebraska, mint/used, binder of Hawaii, Philippines, etc., old "Philatelist's Collecting Book" filled with Revenues, a springback binder with a mint set of arrow blocks of 531, 408-09, layout of four plate positions of a stamp to form a "min-sheet", and blocks of four of Q1-6, plus much more, generally Fine to Very Fine. United States, Mint and Used Collection in Scott National Album, With substantial amount of mostly used classic and 19th Century, and while much of it is in mixed condition some possibly misidentified, the catalogue value is huge, starting with #1, 2 (2), then virtually all spaces filled with stamps from the classic area through the grills, large and small Bank Notes, Columbians missing only the $4, Trans.-Miss. #285-92, 20th Century has scattered Washington-Franklins, Fourth Bureau, and a few later commemoratives, collection a field day for the experts, inspection a must, generally Fine to Very Fine. United States, Used Collection, sparse select collection on Heirloom album pages to 1902-03, incl. #1-2 (both 4 margined with certs. ), 1869 Pictorials with certs for #116, 118-119, 121-122, Columbians to $1 (cert), 311, 313, generally Fine to Very Fine. United States, Oldtime Collection, In three ring binder, starts with #2 pen cancel, 3 and variety of mint and used classics up to 1869 issue which is complete, 112-22, some 1870-71 grills, and later large and small Bank Notes, Columbians 230-39 mint, 3 plate strips of three of 279B mint, used 286-91, 296-9, 323-27 mint/used, then a long 30-year run of mint n.h./l.h. blocks of 4, including 319, 331, 367, 370, 372, 374-75, 425, 513, 530, 539, 548-49, 564, 617-19, 622 (2), 627-28, 632-42 (no 634A), 644-55, 658-60, 670-71, 692-701 (plus dupes), 704-15, plus some Farleys, also 630 White Plains Sheet and full mint set of singles of the Kansas-Nebraska, generally Fine to Very Fine. United States, Commemorative Plate Block Collection, Including a f.-v.f. l.h. plate block of six of #294 (cat. $300), a f.-v.f. plate block of 6 of 330 with modest reinforcement (cat. $3,000), plus plate blocks of 617, 620, 629, 643, 644, 645, 649-50, variety of 2¢ reds, 703-14, 718-19, then virtually solid to 752, including all Farley souvenir sheets, all 3¢ purples to the Prexies, Army-Navy and Overrun Countries complete, 906 and on through the 5¢ commemoratives plus a block of 4 with plate number of C18, generally Fine to Very Fine. United States, 1851 to 1984 Mint and Used Collection, housed in Scott album and various stockbooks, 19th and early 20th Century mostly used, incl. Airs, Special Delivery, Dues, Officials, plus a lightly filled Scott album of cut squares, generally Fine to Very Fine. United States, Large Stockbook of Mint and Used, Nice run from earliest to post WWII, incl. scattering of classics, 1869's, large and small Bank Notes, Columbians to $1 mint/used, used 285/291, 294-99, 300-10, 312, 323-27, mint 328-30, used 331-42 plus a substantial run of mostly used Washington-Franklins, 548-550 mint NH, 658-679 nearly complete mint, some Farleys and Prexie plates and beyond, generally Fine to Very Fine. United States, Minkus All-American Album Collection, Incl. used #230-39, mint 323-330, 551-72 (no 30c), 578-79, 581-91, White Plains Sheet, 658/79 to Prexies, Airmails complete incl. C13-15 (C15 small thin), C18 used, generally Fine to Very Fine. United States, Large Precancel Accumulation, In two cartons containing 11 homemade albums plus plastic bags and glassines of several thousand Bureau Precancels, duplication will be found, noted a few error varieties contained, a large hoard worthy of inspection, generally Fine to Very Fine. United States, 1847 to 1960 Mint and Used Collection, Neatly mounted collection in springback album, noted #1, 36, 71, 72, large Bank Notes, Colombians to 10¢, Washington-Franklin's incl. blocks of Kansas City roulettes, several mint blocks E7 and some used airs, a useful collection, generally Fine to Very Fine. United States, N.H. Plate Block Commemorative Collection, to 1970s in 6 White Ace albums and loose, occasional o.g., starting #537 with 1920s commems. with large tops, #620-621, incl. Airs (C3 block of 4), Presidentials complete, etc., overall Very Fine. United States, 20th Century Oldtime Collection, n.h., on oldtime pages from 1930's to 1950's showing partial sheets, full sheets, FDC's incl. Famous Americans, also backup up collections starting 1893 Columbian with mostly mint, separate album of Famous Americans with FDC's, also Airs, few panes, etc. United States, Mint Collection, Incl. #156, 300-06, 308, decent showing of Washington-Franklins, 397-400, 402-04, 498-518 (no 500, 505), 614-21, 551-72, 578-79, 630 White Plains Sheet, Kansas-Nebraska complete, 692-701, Farleys, Prexies complete, plus Airmails complete C1-C121 (no C13-15), and Back-of-the-Book, incl. Q1-10, generally Fine to Very Fine. United States, Mint and Used Collection in Scott National, With a scattering of classic, grills, #112-116 plus 119 mint, large and small Bank Notes, Columbians to 50¢ mint/used, 278 used well centered small thin, 285-291 mint/used, 294-99 mint, scattered Washington-Franklins, 397-404 (no 400A, 404 used), 630 (trim), most Kansas-Nebraska, then virtually all mint 692 onward, Prexies to $2 including 832b, C1-6 mint/used, C18 mint, Q1-12 used, Back-of-the-Book incl. Ducks RW1-13 (RW2 F/VF mint NH), rest mint/used to RW31. United States, Remainder Collections in 7 Albums, Few thousands with some modern postage and few better used 19th Century, generally Fine to Very Fine. United States, Interesting Mint Accumulation, About 30 1890's to 1930's incl. n.h., #304, and 309, 330, 400, C2, C13, o.g. 290, and 299, C2 block, generally Fine to Very Fine. United States, Mint Collection in All American Album, Few hundred from 1850's to 1962, with few early used, value mainly in o.g. commemorative issues (later issues are n.h.) including #294-299, 323-327, 403, 630, 834, C1-C6, C18 plus few Washington-Franklins and some used Confederates, mostly Fine or better. United States, Collector's Accumulation, mix of mint and used on stockcards and stockpages etc., mostly 20th Century with some 19th, noted #14 used pair, 292 used, 368 grade 100 n.h., 2435b strip of 4, C52 small holes line pair, RE195 sheet of 50, many certs. incl. encapsulated modern graded 95 or 98, also about $250 face, condition varies. United States, Balance of Collection, Few thousand in 7 albums including Lighthouse hingeless album, few better used 19th Century some mint early Commemoratives and modern postage, generally Fine to Very Fine. United States, Better Dealers Stock, About 100 from 1860's to 1920's including used #101, 241, 262, 90¢ Bank Notes, mint 241 (unused), 403, C1-C6, mixed condition but lots of catalog value, mostly Fine or better. United States, Two Volume Strictly Used Collection, Starting with #39, then a few classics, 112-17, 119, good run of large and small Bank Notes, incl. 218 (Cat. $225), 230-40, 264-67, 285-91, 294-99, 300-311, 323-30, 331-42, 397-404, 424-40, 523 (cat. $240), 551-73, 658-79 and then basically solid to 1987, plus C1-2, C4-6 and onward (no C13-15), Special Delivery and Back-of-the-book, generally Fine to Very Fine. United States, Predominately Used Collection, Strong in early classics, starting with used #1, and through the 1857-1867 issues, !869 used from 112-118, lots of large Bank Notes, mostly used but includes a v.g. mint 152 (CV $650), used Columbians 230-39, 242, 285-91, 294-99, 323-36, plus mint f.-v.f. 327, decent run of Washington-Franklins and Fourth Bureaus, 524, 547, mint/used 658/79, Farleys and a few later, inspect, generally Fine to Very Fine. United States, Interesting Collector Accumulation, Few hundred including o.g. C1-C6, used 19th Century, mint 1930's issues and few better covers, worth a close look, mostly Fine or better. United States, Washington-Franklin Group, Hundreds, used, o.g. and n.h., blocks, plate blocks, booklet panes, few singles and pairs, #332/535 identified in glassines, high value, Average to Fine. United States, Mint Collection in Scott National Album, Few Hundred from 1893 to 1941 o.g. including #294-299, 658-679, C1-C6 and some Washington-Franklins, some stuck to pages, mostly Fine or better. United States, 1901 to 1974 Mint Collection, Housed in Lighthouse album, early issues o.g., balance mostly n.h., better items include #294-299 (small faults), 300-310, 323-330, 630, Farley's, and 834, Fine to Very Fine. United States, Mint and Used Collection, 1857 to 1993 plus Airs and Back-of-Book mounted in 2 Harris Classic albums, classics used, noted 6c, 10c, 15c 1869 Pictorials, large and small Bank Notes, Columbians thru 50c (o.g. ), C1 (o.g. ), C18 (o.g. ), RW1, 2 & 4 (used), generally Fine to Very Fine. United States, Plate Block Collection, hundreds in 3 Harris Plate Block albums from 1926 thru 1993, incl. Airs, Ducks, Officials, Dues, etc., majority n.h., incl. C10 (o.g. ), $1 and $2 Prexies, National Parks and several high values, lots of postage, generally Fine to Very Fine. United States, 19th & Early 20th Century Accumulation, Mostly used on Vario pages, starts around 1861 to late 1920's incl. Airs Dues, Special Delivery etc., mostly Fine to Very Fine. United States, 1869 to 1988 Mainly Mint Collection, o.g., some never hinged / some hinged, in mounts in White Ace album, scattered mint and used to 1907 then almost all mint mainly n.h., Back-of-Book incl. E7 n.h., Q1-7 n.h. or o.g., generally Fine to Very Fine. United States, Two Carton Potpourri, An eclectic assemblage containing Revenues on documents, Christmas Seals, cinderellas, souvenir folders, misc. covers, postal stationery, bundleware, etc., plus some Worldwide adhesives in cards (owner' cat over $800), an unusual mixture worth inspection, generally Fine to Very Fine. United States, 1861 to 1965 Dealer Red Box, Mostly used with duplication, owner's cat value $7,000, generally Fine to Very Fine. United States, Oklahoma and Indian Territory Cancels, several hundred town cancels on small cropped piece, majority without stamps, noted several DPO's, late 19th to early 20th Century, Aaron to Zion for Oklahoma, Adair to Zena for Indian Territory, no dupl. noted, all on #102 sales cards, retail prices from $1 to $10, most in the $2-$3 range, cards annotated with date opened/closed, etc., excellent lot for student of postmarks from these areas, Fine. United States, Collection in Mystic Albums, Few thousand from 1932 to 2002, early issues o.g. balance mostly n.h., Fine to Very Fine. United States, Balance of Collection, Many hundreds mostly n.h. incl. coils booklets and sheets including Forever stamps, Fine to Very Fine. United States, Mostly Mint Balance of Collection, Many hundreds in 3 albums, including Schaubek hingeless, better items include #834, few better coils and modern postage, Fine to Very Fine. United States, Collection in Old Nicklin Album, Few hundred 1857 to 1938 majority o.g. with some early used, better items include mint #397-400A, C1-C3, Q10, plus some Back-of-the-Book issues, mostly Fine or better. United States, Interesting Mint and Used Accumulation, Few hundred in 2 stockbooks, including mint #299, used #291 (2), nice group of mint 2 cent reds including blocks, mostly Fine or better. United States, Mint and Used Collection, 1857 thru 1980 plus Airmails in Minkus All-American album, incl. 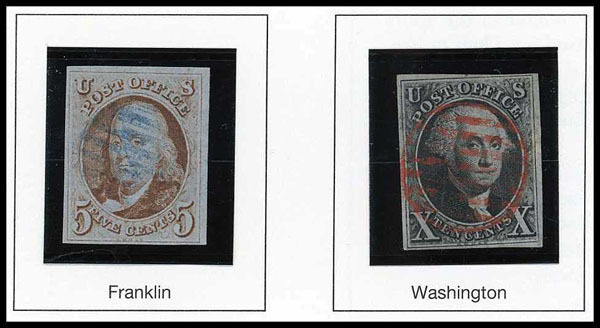 Washington-Franklins, 1st and 4th Bureau issues, Columbians to 10c, Trans-Miss. to 10c, Louisiana, Pan-American and Pan-Pacific issues, Prexie coils and lots of face, mostly Fine or better. United States, Washington-Franklin Group, o.g. to n.h., 24 some n.h. including #395-396 (n.h.), and o.g. 438-439, and 447 pair, generally Fine to Very Fine. United States, 1851 to 1990 Mint and Used Collection, o.g., some never hinged / some hinged, in mounts in Harris album, mixed mint and used to about 1974, then mostly mint, mostly complete from #554, no back-of-Book, Fine or better. United States, Mint and Used Remainders, on pages or in album, incl. RW1-12 (some no gum) and later, Christmas Seals, C18 mint, also lower end used collection and singles. United States, Collection in Mystic Album, Many hundreds from 1870 to 1964, early issues used balance mint, few better 19th Century used, mint #834, and 1053, mostly Fine or better. United States, Used Stock, Many thousands on stockpages in 18 binders, 1870's to 2011, great for a packet maker, Fine. United States, Interesting Mint and Used Accumulation, Many hundreds from 1850's to modern including few better 19th Century Columbians to 50¢ with some lower mint values, generally Fine to Very Fine. United States, Precancel Accumulation, Few thousand Bureaus and Locals, nice variety from 1902 on, generally Fine to Very Fine.